Hubrisween is a yearly event, in which several bloggers review horror and monster movies in alphabetical order leading up to Halloween. During this period, the Web of the Big Damn Spider will suspend its usual policy of focusing exclusively on spider-related materials in order to have enough content to participate. Regular eight-legged posting will return in November. Odds are that Edison didn’t even know this was being filmed. 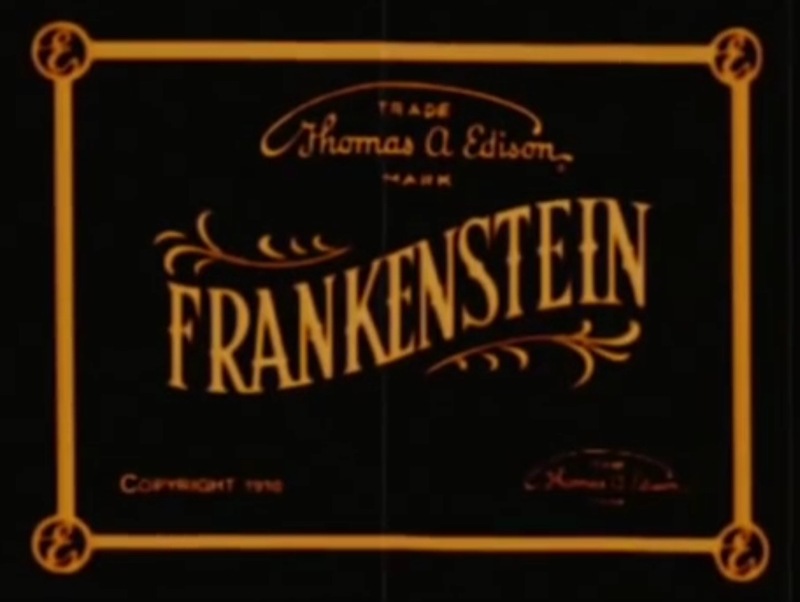 The earliest known film version of Frankenstein; or, the Modern Prometheus was a short produced by Edison’s movie studio in 1910. Relating the complex tale of creation, abandonment, and revenge in less than a dozen minutes cannot be done without some vigorous editing of the story. Even Universal’s iconic adaptation practically rewrote the entire thing, and it had an entire additional hour to work with! Where the 1931 film used a simplified narrative to decisively shift any and all sympathy to the Monster, this version has no such gambit. So much is stripped away that there’s no genuine conflict at all. The plot of the film, barely summarized: Frankenstein goes away to college. Two years later, we’re told via card, he has discovered the secret of life! He writes a letter to Elizabeth to inform he that he’ll be returning to marry her just as soon as he makes a perfect man. He makes a rather imperfect creature, flees to his bedroom, and faints. The Monster lams it. Frankenstein returns home and furthers his plans to wed Elizabeth. After talking to her in a parlor, he is startled by the appearance of his Monster. The Monster is startled by its appearance as well, finally getting a look at itself in a large mirror. It hides when Elizabeth returns to the room and waits while Frankenstein ushers her out. Once they are alone, man and Monster wrestle — but only until the Monster sees itself again and flees. Frankenstein and Elizabeth finally wed, and while Elizabeth prepares for her opening night as a Frankenstein, her husband wanders off. Cue the inevitable reappearance of the Monster, who we are told is jealous of Elizabeth. 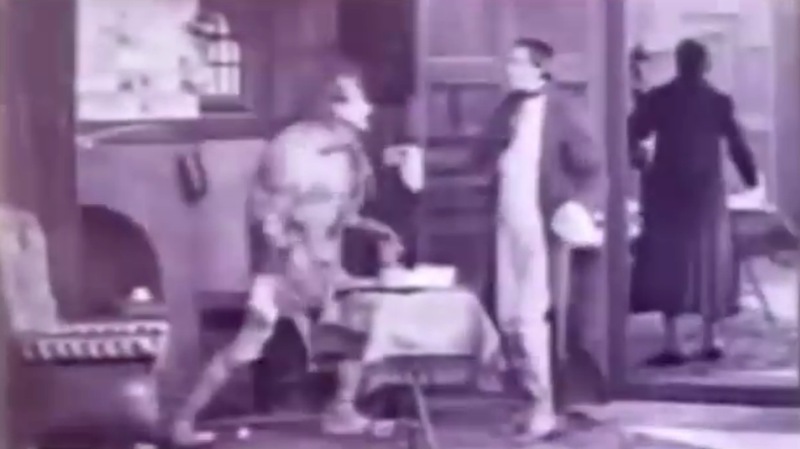 Elizabeth runs to Frankenstein and faints at his feet. The Monster comes after her and gets into an argument with its creator. For no clear reason it runs away just as Elizabeth awakens. We’re told that the “creation of an evil mind is overcome by love and disappears”. The Monster returns to the parlor where it sees its reflection once more. It vanishes, leaving its image in the mirror. Frankenstein comes in, and the Monster’s reflection is subsumed by his own. All is happiness and hugs in the house of Frankenstein. Narratively, it’s unsatisfying; the ending is practically gibberish, and Frankenstein goes from evil to the purity of love in about a minute of screen time with no impetus or explanation. We’re simply told his evil created the Monster, and then that his love destroyed it. The Monster costume itself is… let’s just say it’s unimpressive. Fright mask, goofily long fingers and toes, and ragged clothing. The whole endeavor is shockingly bad in comparison to many other films of the time, and I have to wonder if there were bigger plans that got scrapped at the last minute. What if I slouched? Would you feel menaced then? As the film stands there are only two reasons to watch it; three really, but two are pretty much the same. The first is historical interest. It was thought to be lost until a collector in the 1970s revealed that he’d purchased a copy from his mother-in-law 20 years earlier. So much has been lost of early film that a miracle like this shouldn’t be ignored. Closely aligned with this reason for viewing is simple curiosity. The Frankenstein Monster is a looming figure in Western culture and media. This is the earliest image of Shelley’s work being recorded for presentation to the masses. There was a play in the early 1800s, but this is where the tale lurches into a new age. No matter the film’s faults, that’s pretty damned cool! Fortunately, there’s one more reason to spend the 10 minutes to watch this on YouTube. The creation sequence is ingenious if not also a touch unsettling. For whatever reason, Dawley decided that Frankenstein spent his two years in college learning alchemy. Chemicals are stirred in a cauldron, which is placed in a large kiln to cook. In a creepy bit of reversed footage, we see the Monster rise and form in fire. It’s a nifty effect, no less stunning for its simplicity. It’s a shame that the next Frankenstein movie didn’t survive as well. It would be interesting to compare it with this one and see a little bit more of the path that led the definitive film version in 1931. Though Hammer later made Peter Cushing the superlative Frankenstein, it’s the Boris Karloff version that remains the definitive performance of the Monster.